The engine was a very large locomotive built by McLaren in around 1909, I have seen it quoted as both 10 NHP and 12 NHP so one of the biggest engines they made for the UK market. The engine was fitted with a spoke flywheel, although in the picture a plate cover has been added and was named Nil Desperandum. The blast pipe arrangement into the smokebox is unlike most McLaren road locomotives of the time, perhaps an experimental feature. Allen Knight were boiler makers as well as engine dealers who had a large number of engines through their business. The engine is photographed at their works which is familiar as it was beneath the railway arches on Viaduct Street in the town. I have a list of engines that they owned as well as more pictures, I will try and post another item about them in due course. 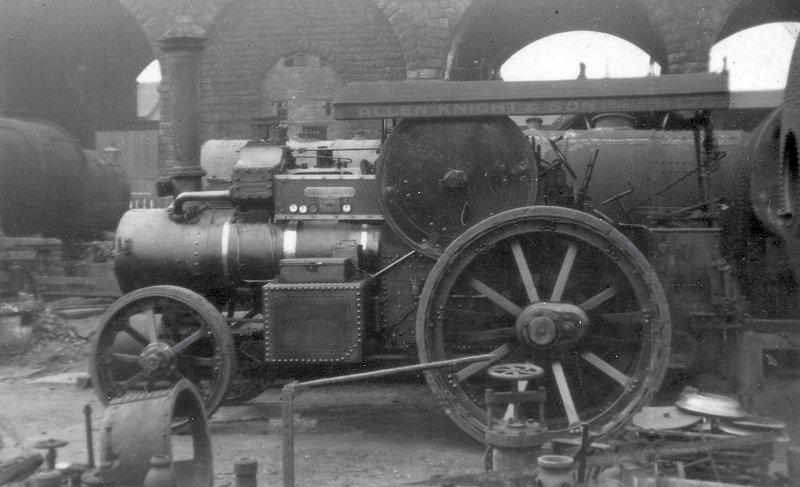 I'd say this is 956, a photo of the opposite side appears in John Crawley's book Traction Engines In Focus. It's a 10hp engine, with 7" and 11" cylinders.The exhaust pipe going into the smokebox was a feature of this type of engine, and if it's the same as its two sister engines, 955 and 957 which both reside in NZ, it would have been made of copper.The engine is also fitted with rack steering, the worm of which is contained within a casting inside the front tank. Thanks Earle. I will try and dig out a copy of the photograph in John Crawley's book. I didn't know about these unusual features on the engine. My Grandfather Harry Ingham worked as a labourer for company that installed and removed boilers in mills etc. he had an unusual saying "nil despairandum", as a child I had no Idea what this meant.Later in life I learnt that this was lattin for dont despair or dont give up. researching further in to my families past I out that nil desperandum was the name of the steam engine that he worked with. Its wonderful that there is a picture of this machine, does it still exist to this day? Hi Nigel, thank you for your comment - what a great story. I bet your Grandfather could have told some very interesting tales. Sadly no, this engine does not survive, Nil Desperandum had been broken up by the early 1950's. It would be a much prized example had it made it into preservation. Okay so what the hell is this Allen Knight’s and his McLaren Nil Desperandum, like does that have anything to do with how to a research paper or is that totally different here? I would really like to know ! on all subject so I did not miss any of the class. I hope I pass this exam with good marks this year.